Lake Ngami, Botswana, in December 2005 (download report). Thyna saltpans, Tunisia in May 2006 and April 2007. Dandora Ponds and Lake Elmenteita, Kenya, in February 2006 and 2007. 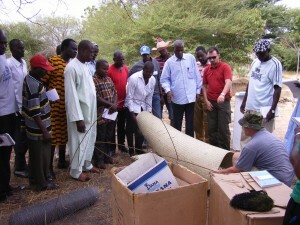 Hadejia-Nguru wetlands, northern Nigeria, in October 2009 and February 2010 (download report). We also hosted a training course at WWT headquarters, Slimbridge, in autumn 2007 (download report). Around 10 people attended several of these courses, giving them extensive experience from a range of situations. Much of this work was carried out in partnership with Wetlands International and the Food and Agriculture Organization of the United Nations as part of its programme of training for waterbird ringers to conduct live bird surveillance for avian influenza. This also provided an excellent opportunity to build general capacity for waterbird ringing in various parts of Africa, both in terms of technical experience and equipment provision.